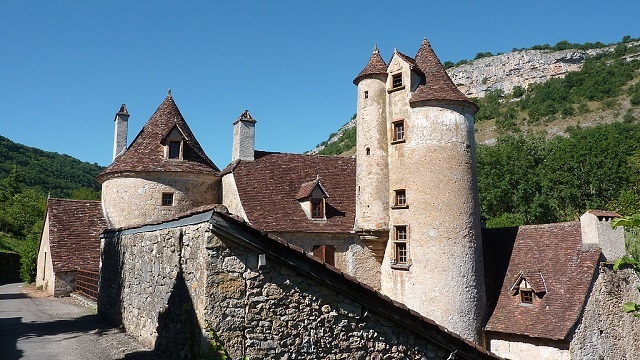 Notes: The castle of Limargue is located in the commune of Autoire, in the department of Lot.For Catherine Didon, a legend runs through the village about this castle. To reward the bravery of a certain Lafon on the battlefields of Italy, King Charles VIII would have rewarded him by giving him the privilege of having a house with towers and machicolations which was a right attached to the nobility. The man named Lafon would then have added to his lodgings simple towers and engraved on a lintel of a tower the coat of arms that he had chosen, a star, perhaps the one that bears luck. A door with brace gives access to the spiral staircase. The tower has been registered for historical monuments since April 6, 1929.The mansion includes a main house and a lower wing in return. A tower with staircase, with five levels, is placed in the corner of the two bodies of the house. At the level of the third level, it carries a corbelled turret surmounted by a roof of a pepper shaker that allowed to reach the room, bedroom or closet on the top floor.